Thai Seafood Sauce Recipe: The Ultimate Seafood Feast? 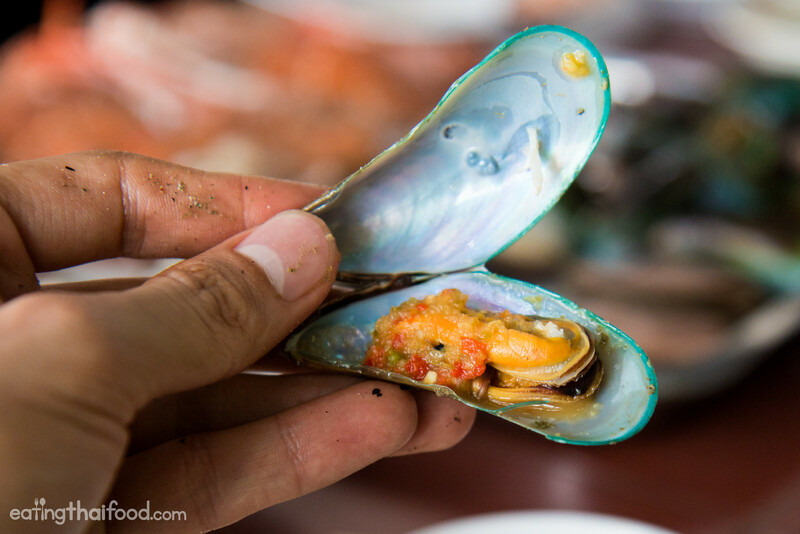 There are a ton of different ways to prepare and eat seafood in Thailand. 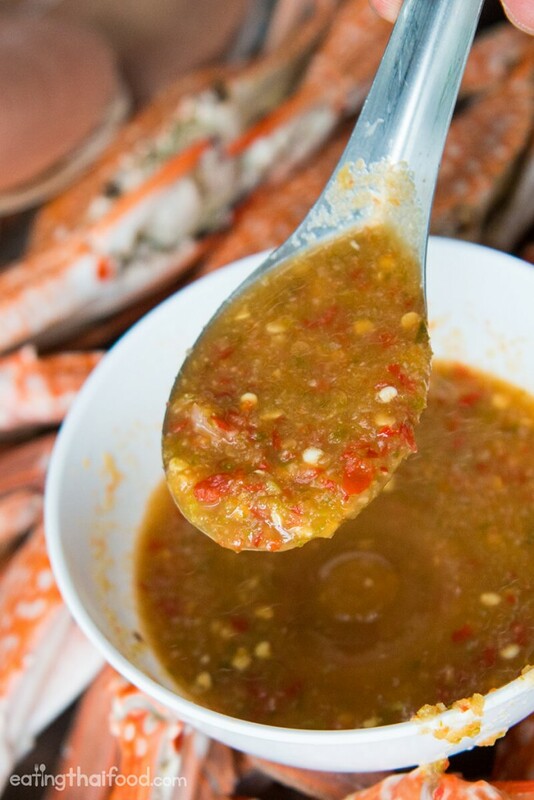 But one of the most popular and purest ways, and it’s simple too, is to just boil or grill up a mess of fresh seafood, and serve it with nam jim seafood, Thai style chili garlic dipping sauce. I really didn’t know what we were planning to do. All I knew is that we had a car, I was driving, and my wife and her sister’s had booked a house on the beach near Pattaya. So it came to Saturday morning, we got into two cars, and started driving south from Bangkok en-route to Pattaya. 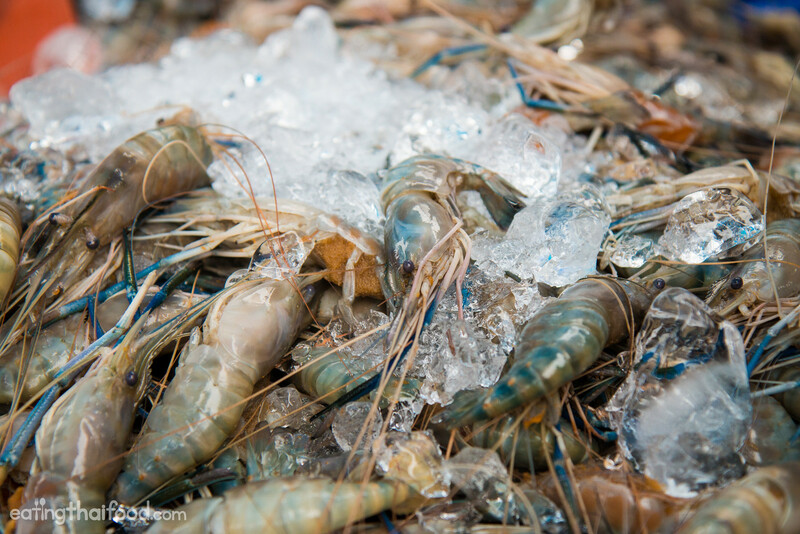 Ying mentioned to me that we might stop at the Samut Prakan market to buy some seafood, but instead we continued driving on the highway for about an hour, until we reached Ang Sila Market in Chonburi – an old seafood market on the ocean. 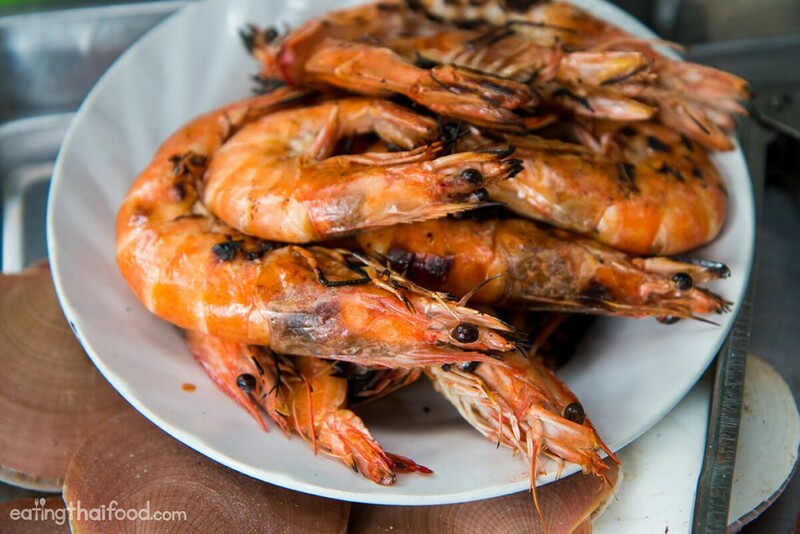 After eating, there are few things I enjoy doing more than walking around markets, and seafood markets in particular are some of my favorites. Ang Sila Market (อ่างศิลา) is famous for seafood, and there was abundance of both fresh seafood and dried seafood available. We were there for the fresh seafood, and my mother in-law and wife, after we took a little stroll through the market to get our bearings, went all in and started buying seafood in all shapes and sizes. I followed loosely behind, trying to capture the markets in photos and videos, and enjoying the beautiful selection of freshly caught seafood. This is a market where much of the seafood comes straight off the boat and is sold right then and there. 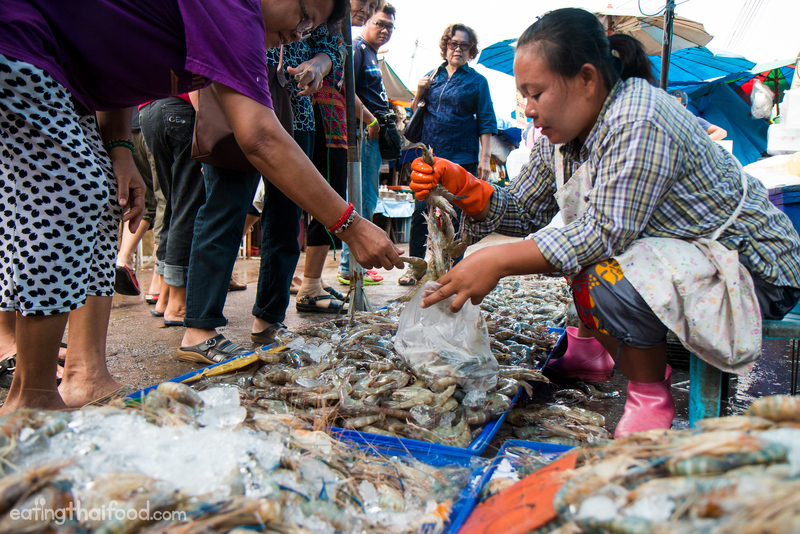 Much of the seafood was extremely fresh, and much cheaper than you’d find it in Bangkok. 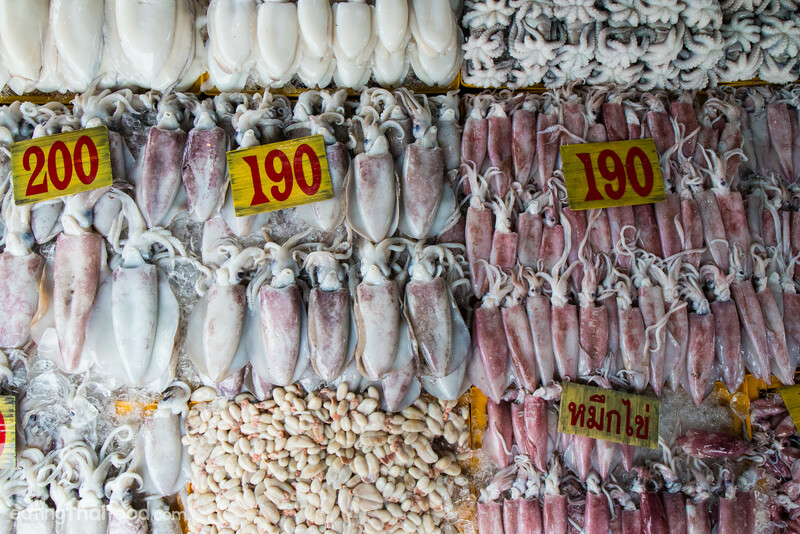 And Ang Sila Market (อ่างศิลา) is a squid lovers dream come true – they have nearly every size, shape, and type of squid you can imagine, in both fresh and dried form. The stall we chose to buy the squid from had all the squid lined up like rows of shoes, sorted by type and with the price clearly on display per kilo. My mother in law chose some of the medium sized squid, the purple colored ones, which are one of the Thai favorites especially for grilling and eating with Thai seafood sauce. You might know that shrimp are one of my favorite things in the world to eat, but even better than shrimp for me, is crab. 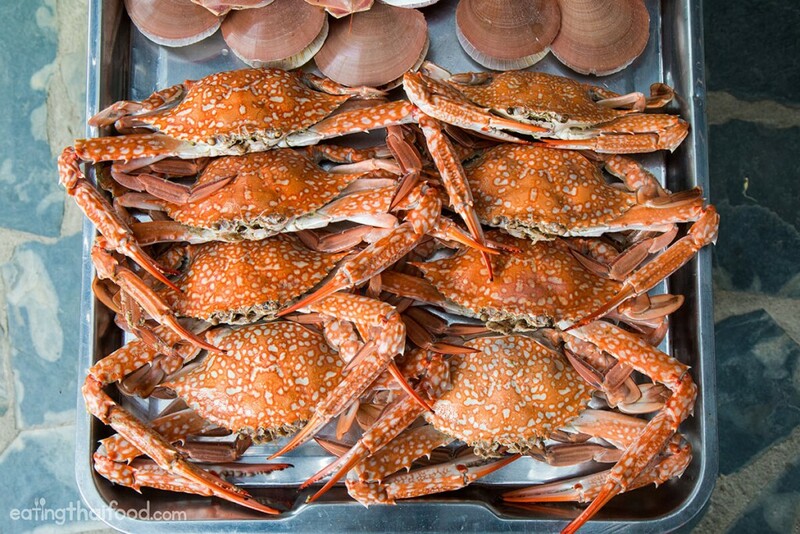 Just like squid, at Ang Sila Market there was mind blowing collection of mud crabs, which all looked incredibly, but we decided to get what in Thai is called boo ma (), or blue swimmer crabs. I’ll have to wait for next time to get some mud crabs. Then we went to a vendor selling all things shells. A Thai seafood party would never be complete without a bunch of hoy kraeng (หอยแครง), blood cockles, which are probably the ultimate favorite shellfish across Thailand – it’s one of the biggest Thai comfort seafoods. 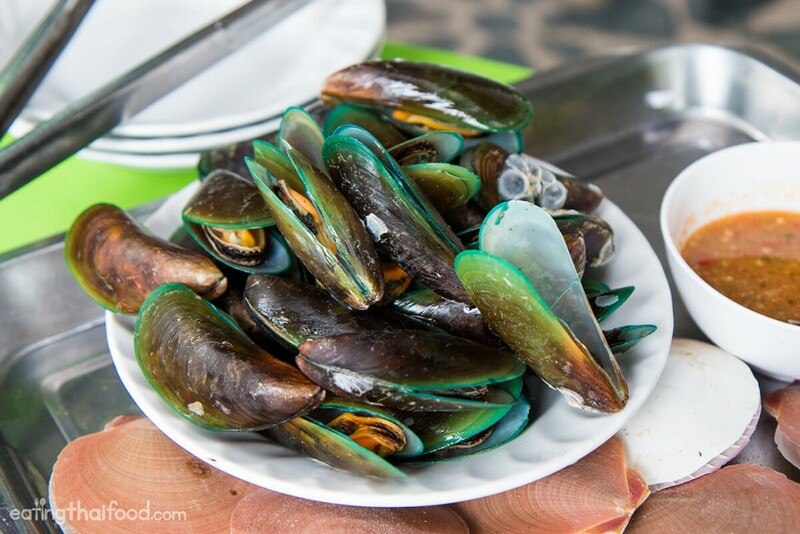 Along with blood cockles (หอยแครง), we also got local mussels (หอยแมลงภู่), and a bag of hoy talub (หอยตลับ) which are a type of clam. Additionally, there was no way we were going to leave the seafood market without some shrimp (กุ้ง). There were many different sizes, but we chose the medium sized ocean caught shrimp. Finally, we got a couple pla kapong (ปลากะพง), barramundi fish, just in case we were still hungry. 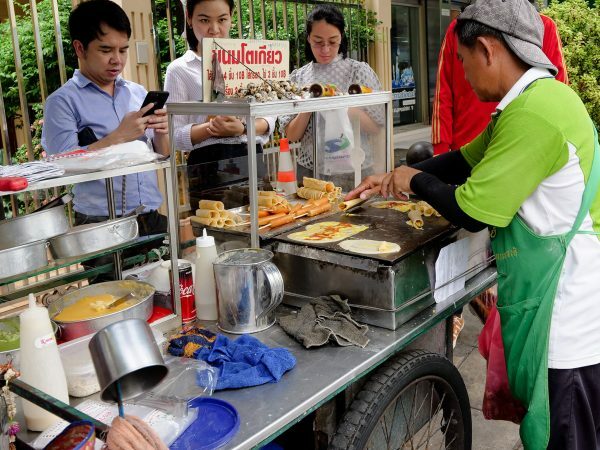 While Ang Sila Market is mostly about the seafood, there are also a few other things available at the market, including khao lam (ข้าวหลาม), sweet coconut milk sticky rice roasted in a pole of bamboo. Before getting back in the car, my wife bought a couple cups of khao lam (ข้าวหลาม). 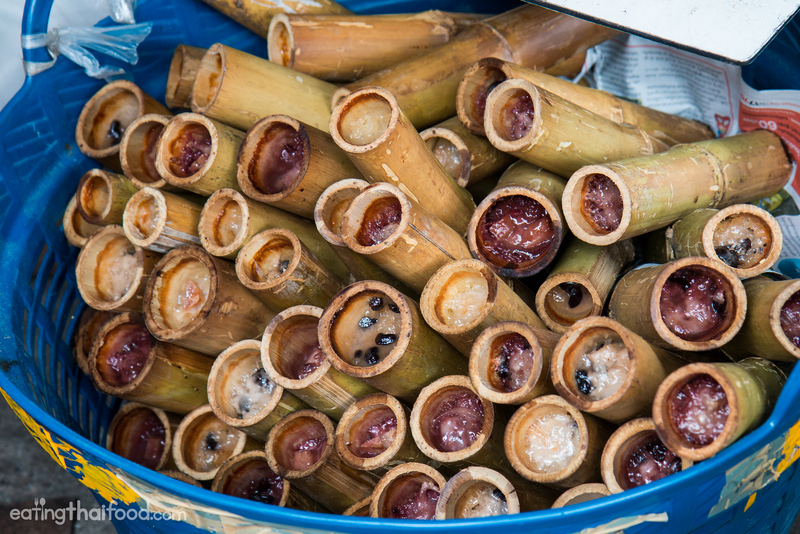 Along with having the traditional version, in a pole of bamboo about a foot in length, they also had little cups of khao lam. 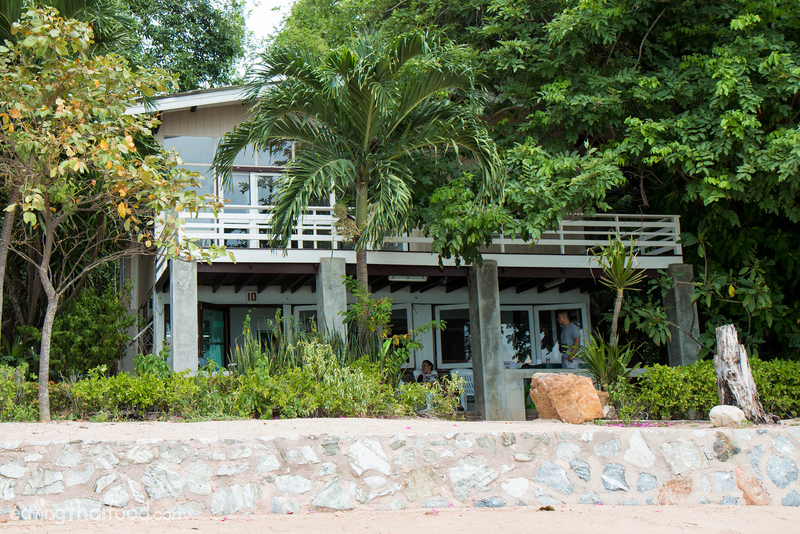 We got back on the highway, and drove on to Pattaya and directly to our beach house at Moonlight on The Sea Pattaya. The house they booked was right along the beach, and while the beach wasn’t extremely nice, we did have a front row view of the famous wooden temple of Pattaya (though I didn’t go inside to check it out). The beach improved as the tide came up, and the scenery was alright, not amazing, but it was still nice to be on the ocean. Our house for the night was basic, but big and spacious and included 4 rooms and a big downstairs are for cooking and eating. Seafood was what I was most interested in, and after walking around the market earlier in the morning, I was hungry and anticipating all the food we had purchased. We got straight to washing all the seafood and lighting the grill. Fresh seafood doesn’t need any seasoning, especially when you have the Thai seafood dipping sauce on the side – recipe below. 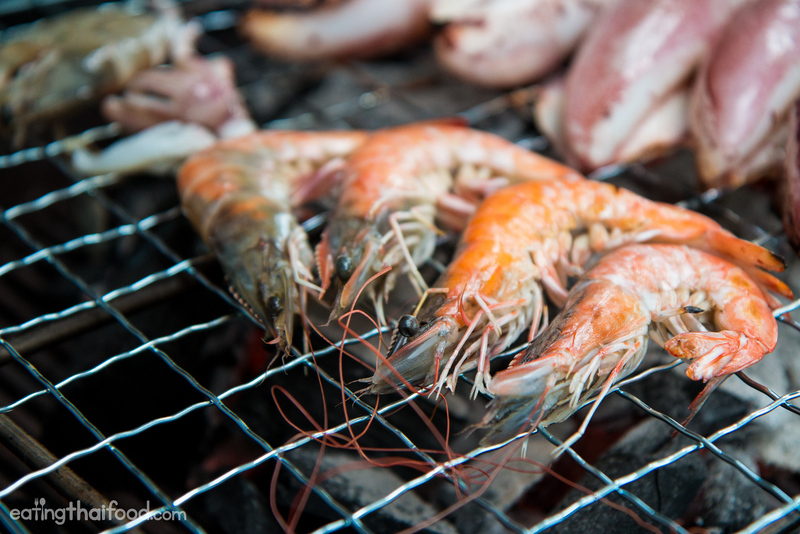 But depending on your preference, and depending on which type of seafood does better in which cooking style, you can either boil, steam, or grill. 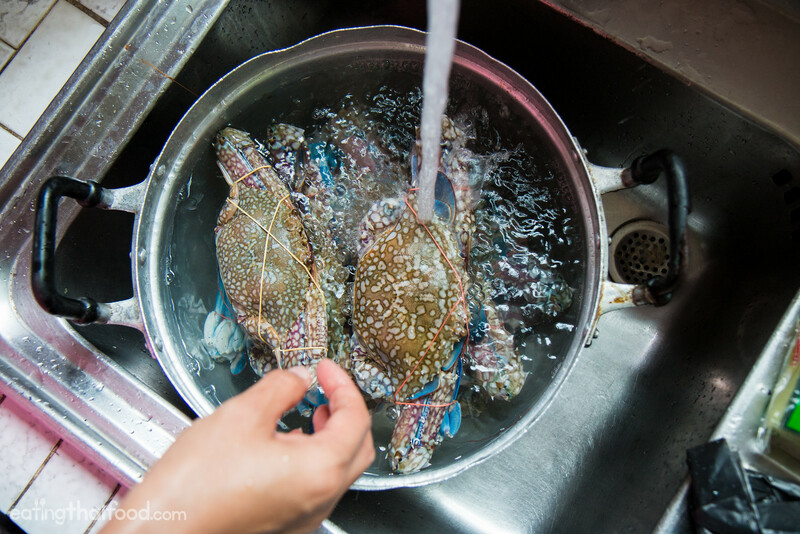 For the blue swimmer crabs we gave them a quick boil. And for most of the shellfish we also boiled them quickly, and then stir fried the clams with sweet basil. That was it for the boiled seafood. 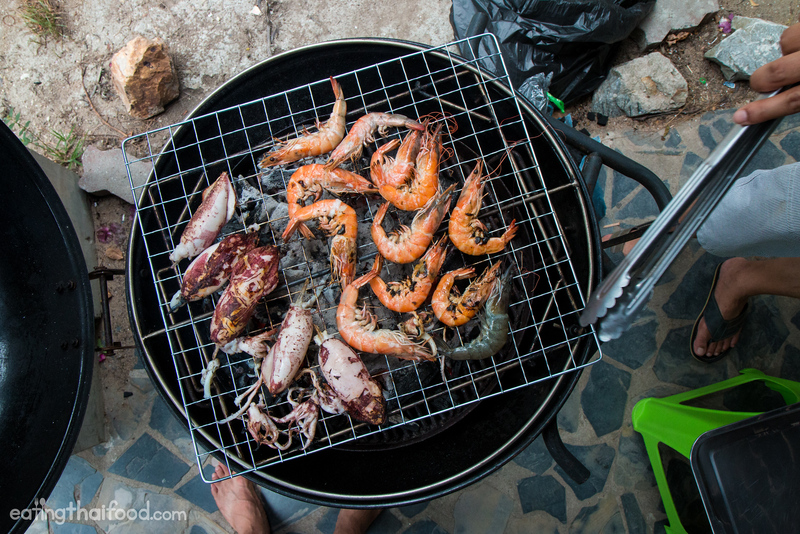 For the shrimp, scallops, and squid, we cooked them on the grill. All we did was wash rinse everything in water quickly, then onto the grill they went. The only thing to worry about is making sure you don’t overcook anything. Seafood is so good, but when it’s overcooked, especially squid and shrimp, it gets rubbery and isn’t good at all. For the shrimp we grilled them whole when head and shell on. That way the shell turned orange and slightly blackened, leaving all the meat inside protected. They weren’t quite as epic as the best prawns I’ve ever had in my life, but they were still amazing. 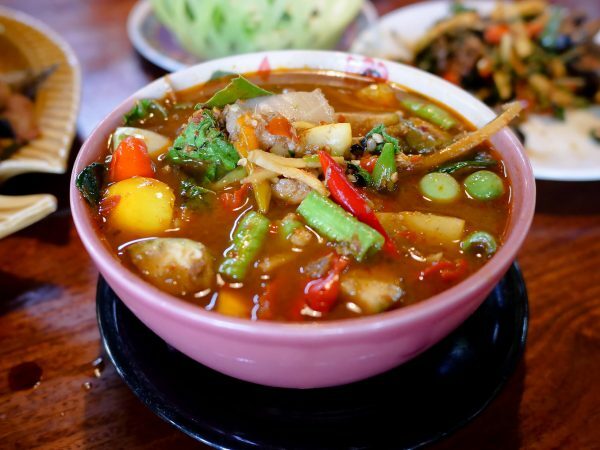 You could steam a fish with lime juice, garlic, and chili, or you could make a squid curry with coconut milk, but probably the easiest way to get a taste of Thai seafood at home is by doing nothing more than making Thai seafood sauce. The seafood, whatever seafood you choose, can either be boiled, steamed, or grilled completely plain, and as long as you have a bunch of Thai seafood sauce, you’re good to have a Thai seafood party. 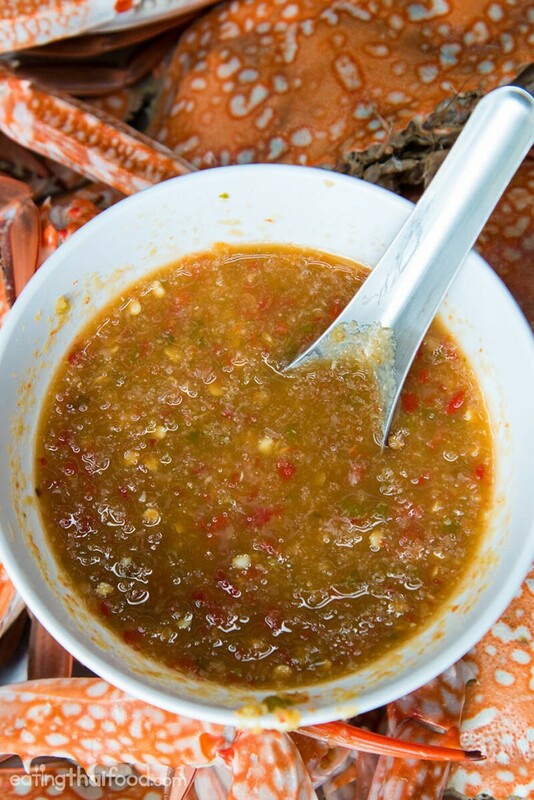 Thai seafood sauce is the all purpose Thai sauce for anything that comes from the sea. The good news is, it’s really easy to make, it tastes amazing, and only takes a few ingredients. In Thailand everyone likes their sauce a bit different – I like it mine more sour and spicy, my sister in law likes it more sweet and sour. For our seafood feast in Pattaya, my mother in law made two version of seafood sauce, one more sour and spicy, one more sweet. We were all happy! So it’s really up to you and your personal taste preference. You can try the ingredient amounts that I’ve listed below, but don’t regard that as the standard. It’s really up to you. Nam jim seafood (น้ำจิ้มซีฟู้ด), also known just as Thai seafood sauce is the go-to sauce for all forms of Thai seafood. If you make this sauce, you can cook any type of seafood plain, dip it in this sauce, and it will taste amazing. Also, I can’t emphasize this point enough – use these ingredients as a guide, not as strict amounts. You need to add then taste test until the flavor is right for you. 2 tablespoons fish sauce (น้ำปลา), alternatively use only salt or some salt and some fish sauce if you don’t like the fishy sauce flavor – some Thais prefer using only salt in their seafood sauce. Add the bird chilies and peeled cloves of garlic into a mortar and pestle. Toss in ½ teaspoon of salt, and start pounding until coarse, making sure all the oils are released (should take 5 – 10 mins). Alternatively, blend or use a food processor or even just mince if you need to, but grinding by hand is the best method. Add the crushed chilies and garlic to a bowl, then add the lime juice, water, fish sauce (or salt), and sugar, and mix thoroughly. Start adding the ingredients especially the fish sauce and sugar gradually, and taste test and add more as needed. 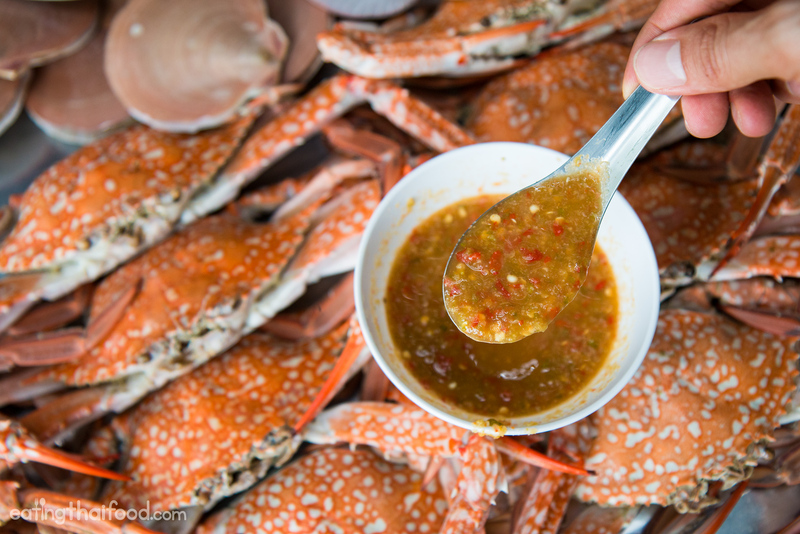 Nam jim seafood (น้ำจิ้มซีฟู้ด), Thai seafood sauce is easy to make, and it tastes amazing with any types of fresh seafood. 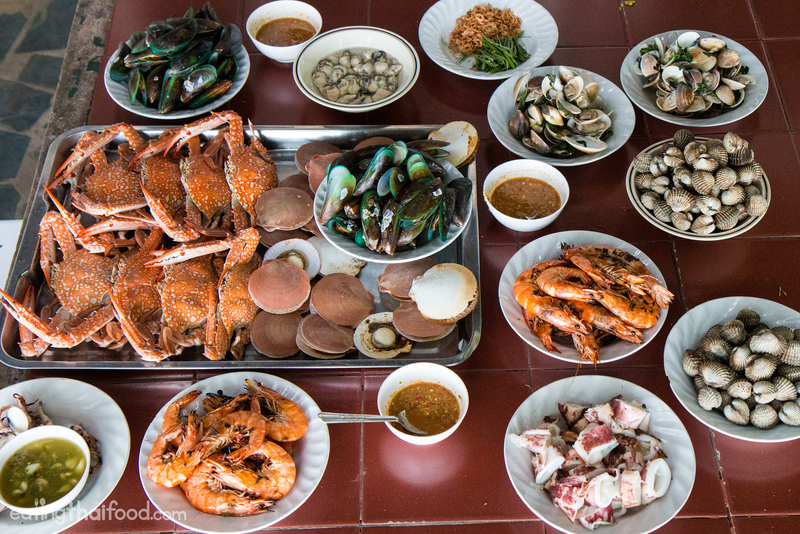 Having a Thai family seafood feast is kind of like a New Orleans style crawfish boil. 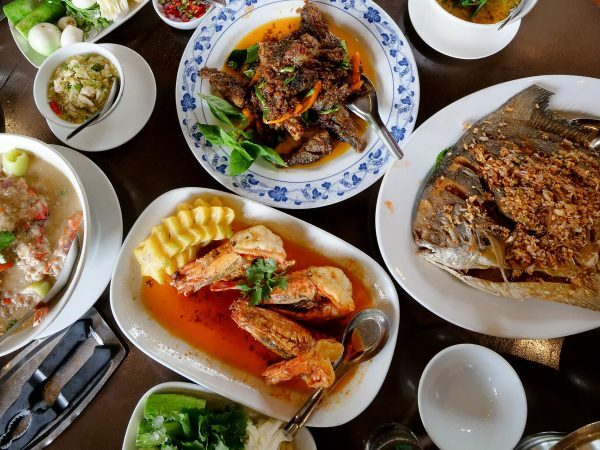 Once you have your Thai seafood sauce ready and your mess of seafood is cooked, it’s easiest to just put it all on trays, plates or newspapers on the table, and then just started going head first into all the delicious seafood. 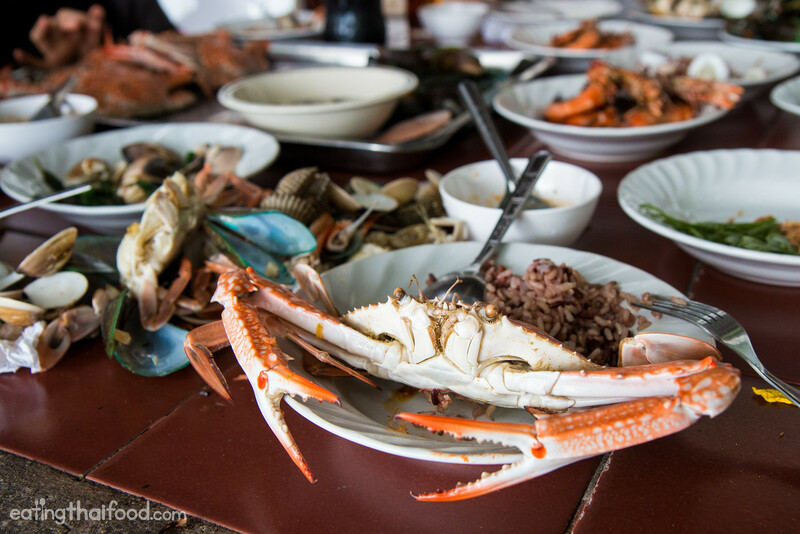 Seafood, especially for those who grew up in coastal areas of Thailand, is often eaten at family get togethers, parties, and festivals. 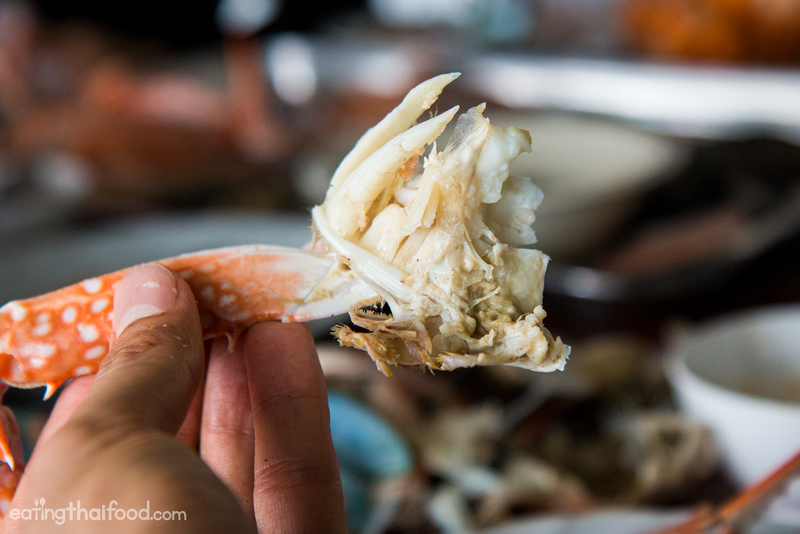 One weekend, my wife, her family, and I took a drive over to Ang Sila Market, a seafood market in Chonburi about an hour from Bangkok, bought a ton of different fresh seafood, and proceeded on to a beach house in Pattaya. For the rest of the day we sat around cooking and eating seafood, dipping it all into the classic Thai garlicky chili seafood sauce. It was my kind of a family vacation. 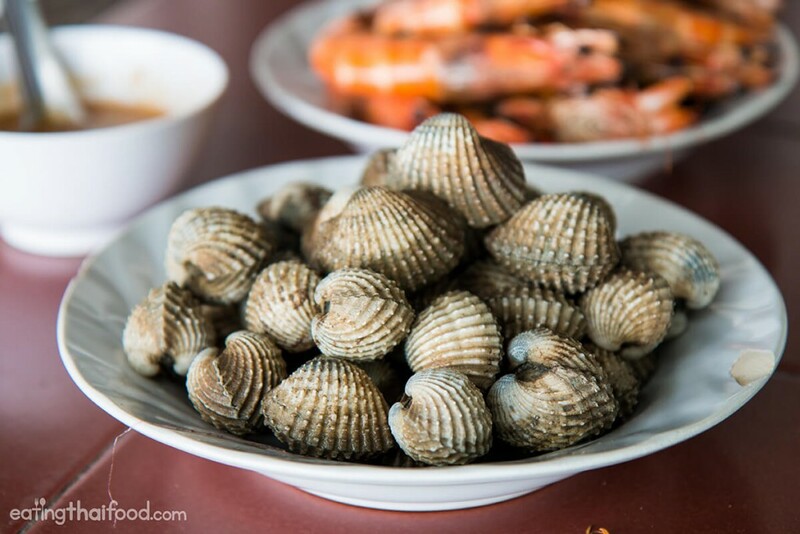 One of the easiest ways to enjoy a taste of Thai seafood is to just boil or grill your seafood of choice and make a big communal batch of nam jim seafood to go with it. It’s simple, easy to prepare, and as long as your seafood is fresh, it’s a meal you can’t go wrong with. Are you ready to eat some seafood? Hi! This looks amazing. If not too forward, I was just wondering roughly what the feast cost in USD? Also, how many did this feed? We would love to take our family and wonder how much we would need to save for a trip like this. Thank you for the pics, the recipe, and making me hungry! Sounds like an ideal weekend. Just eating fresh seafood. I’m salivating!! Mark, great videos. 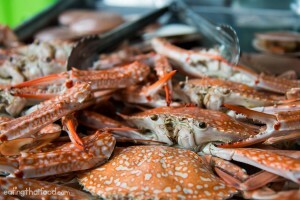 Can you comment on the rice on your plate with the Blue Swimmer crab? It does not look like plain rice or sticky rice. Seems a bit unusual. Thanks. I’ve been watching your videos on you tube, and love all the places you’ve been to. I am loving all these recipes you have kindly posted. Will for sure try them. God Bless you and your family. Safe travels..! How long can the Thai seafood sauce last in the fridge? Amazing and thank you for the recipe to make seafood sauce.We like it extra hot !! I think you too, right? I ‘ve seen you eat chilliiii ! I just tried this receive.. amazing teste I love it .. thank you ???? Sauce is hot as S$&T but soooooo delicious !!!!!! !I put in a good amount of sugar and a few more garlic cloves and man this sauce was shining! Mark what is best if traveling back to Bangkok with taxi and bunch of luggage if we want to stop at this market? Love it,how much you spent altogether with the beach house. Let me know how you booked the beach resorts. Your blog….is amazing…i had been living in Asia for one year and a half….including more than 8 months in thailand….in fact some months ago i have a thai girlfriend too. I’m a experienced spanish cooker…but i really love thai food and i have to be very grateful to you because your blog was a truly reference during my first 3,4 months in thailand….thanks so much without your help about all kind of thai food never had discovered all this amazing world….and how order thai food in thai….thanks again you are like a friend always helping…today with the amazing nam jim!!! Hi Greg, great to hear from you, thank you very much for your kind words and support. Glad you enjoy Thai food so much. Enjoy the nam jim seafood! Hi Redenia, yes fresh chilies. Enjoy! Love the recipe. 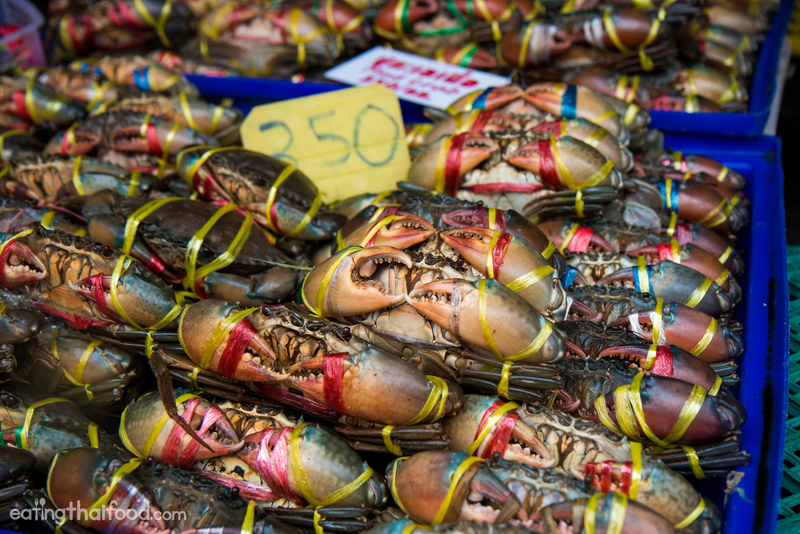 We actually live in Bangsaen, just up the road from Ang Sila fish market! Still have my mortar and pestle I bought at the market there! Hey Damon, thank you very much, very cool to hear that. That’s an awesome market! Last year we had a beautiful addition to our family, her name is Patumporn whom we affectionately call Mook. She is from Bangkok and married my son last April. They are planning a wedding celebration in Thailand next January and I am making plans to go. Mook and I share the common ground that we both love to cook, but our American foods tend to be heavy and bland compared to Thai food.Your video blogs have inspired me to try new dishes and spices. Through your eyes I am getting a glimpse of Mook’s culture which helps me to make her feel more at home. Thank you for your inspiring video’s and making the food look so good that I want to try it all. Hi Penny, this is great to hear, congratulations to you and your son! And that’s fantastic how you’re cooking and learning more about Thai flavors and tastes. Glad you’ll be coming to Thailand soon. Thank you for your support! Found your videos when I was researching spots to go in Kyoto. And then got hooked and found all your other videos. They are really hot! Good stuff Mark. Keep them coming! Shawnn Lai – Singapore. PS: I can’t believe your tolerance to the small Thai chillies! Well done! Hey Shawnn, nice to meet you and thank you very much for your support and watching our videos! Hey Ove, great to hear from you, glad you enjoyed this Thai sauce recipe. I’ll try to post more Thai sauce recipes in the future. Thank you again! Hey Mark! Awesome recipe! Was wondering how long could you keep this? You’re welcome, thanks for reading Jon. It would be best to eat it the same day as the chilis and garlic will taste best, but I think if you put it in the fridge it would keep for a few days. Hey Ngoc, good to hear from you, thank you for reading. Enjoy! same question as Ray, but also how to rent the beach house ? how far the seafood market from pataya ? Hi Choi, here’s the website for the beach house: http://www.moonlightonsea.com/index.php I think my wife’s sister called them to make a reservation, but she mentioned that on the weekend they are always pretty full so you may need to book in advance or try to book for weekdays. 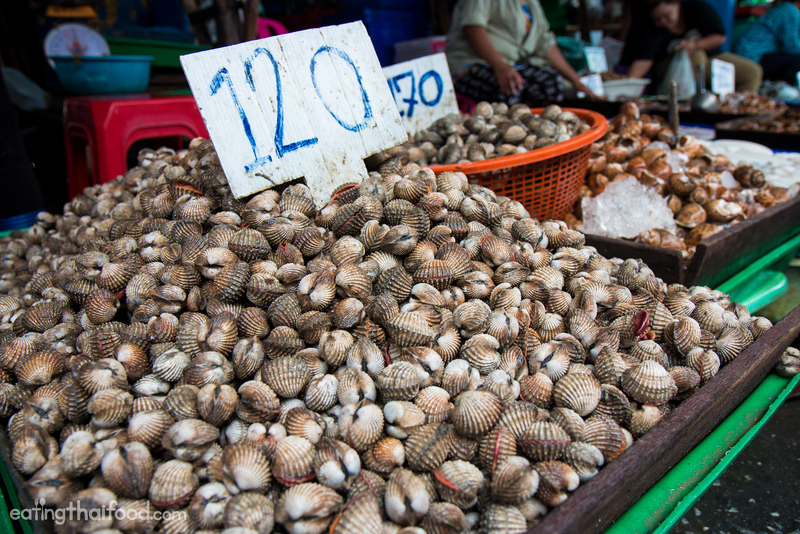 Ang Sila seafood market is close to Bang Saen, and about a 30 minute drive from Pattaya. Hope this helps! just wondering did the accommodation come with its own cooking pots etc.. bbq grill? would love to go up and do exactly what you did there too!! Hey Ray, thank you very much. Yes, the place came all furnished with the grill and cooking pots / eating utensils / plates. We just showed up with our food. The beach wasn’t amazing, but alright during high tide and it had a nice view of the Sanctuary of Truth temple on one side, and sort of an industrial view of Chonburi on the other side. But during high tide the water was good for swimming, and a good place to get out of Bangkok quickly. We were in Singapore for only a few days a few months ago. But I’m hoping to go back again soon, and I will let you know for sure. You’re still in Bangkok right?